Brisbane is the third largest city in Australia and the most populous city of Queensland, of which it is the capital. It is situated on the Brisbane River on a low-lying Floodplain between Moreton Bay and the Great Dividing Range in south-eastern Queensland. The local indigenous people knew the area as Mian-jin, meaning "place shaped as a spike." The city is named in honor of Sir Thomas Brisbane, the Governor of New South Wales from 1821 to 1825. The island nation was initially a site for penal colonies in the eighteenth and nineteenth centuries, with Brisbane's creation taking place for the same purpose in 1825. However, just over a decade after its initial settlement, missionaries moved into the area, followed by free settlers several years later. 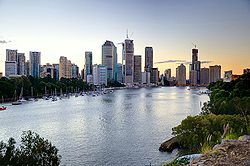 Queensland was proclaimed a separate colony on June 6, 1859, with Brisbane chosen as its capital, although it was not incorporated as a city until 1902. Australia as a whole, and Brisbane included, has developed a robust economy and peaceful way of life. Brisbane is described as sophisticated and progressive, dynamic and diverse. It is an energetic and active city, with an attitude that is open to and encouraging of creative free thinking. Its local artists, musicians, writers, jewelers, and fashion designers have made names for themselves internationally. At the same time, the city is unpretentious and grounded. The city played a central role in the Allied campaign during World War II as the South West Pacific headquarters for General Douglas MacArthur. More recently, Brisbane hosted the 1982 Commonwealth Games, 1988 World's Fair (Expo '88), and the 2001 Goodwill Games. 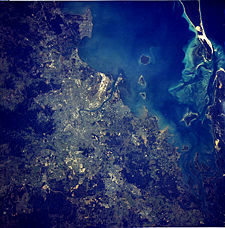 Satellite Image of Brisbane Metropolitan Area from Space-station. The city's early name, Edenglassie, was changed to honor Sir Thomas Brisbane, the Governor of New South Wales from 1821–1825. The local indigenous people knew the area as Mian-jin, meaning "place shaped as a spike." It is situated on the Brisbane River on low-lying floodplain between Moreton Bay and the Great Dividing Range in south-eastern Queensland. The urban area, of 2280 square miles (5904.8 square kilometers), is partly elevated by two large hills reaching up to 980 feet (300 m), Mount Coot-tha and Mount Gravatt in the south. Mount Petrie at 560 feet (170 m) and the smaller rises of Enoggera Hill, Highgate Hill, Mount Ommaney, Stephens Mountain, Toohey Mountain, and Whites Hill are dotted across the city. Brisbane has a humid subtropical climate, with hot, humid summers and dry, mild winters. From late spring through to early autumn, thunderstorms are common, with the more severe events accompanied by large damaging hail stones, torrential rain, and destructive winds. Temperatures range from a mean daily maximum in January (summer) of 84.2°F (29°C), and in July of 69.6°F (20.9°C). The city's highest recorded temperature was 109.76°F (43.2°C) on January 26, 1940. Mean annual total rainfall was 37.24 inches (946.1mm) in 2008. Many suburban creeks criss-cross the city, increasing the risk of flooding. The city has suffered two major floods since colonization, in 1893 and 1974. Water storage, treatment, and delivery for Brisbane is handled by SEQ Water, which sells on to Brisbane Water for distribution to the greater Brisbane area. Water for the area is stored in one of three dams; Wivenhoe, Somerset, and North Pine. The Windmill in Wickham Park in Brisbane. Built by convicts in 1828, it is one of the oldest buildings in Brisbane with the Old Commissariat Store on William St.
Brisbane was inhabited before European settlement by the Turrbal people whose ancestors migrated to the region from across the Torres Strait. The Moreton Bay area was initially explored by Matthew Flinders, landing and naming "Red Cliff Point"—after the red-colored cliffs visible from the bay, known today as Woody Point—on July 17, 1799. In 1823, Governor of New South Wales, Thomas Brisbane, instructed that a new northern penal settlement be developed, and an exploration party led by John Oxley further explored Moreton Bay and sailed up the Brisbane River as far as Goodna, some 12 miles (19 km) upstream from the Brisbane central business district. Oxley recommended Red Cliff Point for the new colony, reporting that ships could land at any tide and easily get close to the shore. The party settled in Redcliffe on September 13, 1824, under the command of Lieutenant Henry Miller with 14 soldiers, some with wives and children, and 29 convicts. However, this settlement was abandoned after one year and the colony was moved south to a site on the Brisbane River at North Quay, 17 miles (27 km) south, that offered a more reliable water supply. Non-convict European settlement of the Brisbane region commenced in 1838. German missionaries settled at Zions Hill, Nundah, as early as 1837, five years before Brisbane was officially declared a free settlement. The band consisted of two ministers, Christopher Eipper (1813-1894) and Carl Wilhelm Schmidt, and lay missionaries whose names were Haussmann, Johann Gottried Wagner, Niquet, Hartenstein, Zillman, Franz, Rode, Doege, and Schneider. They were allocated 260 hectares (642 acres) and set about establishing the mission, which became known as German Station. Free settlers entered the area over the following five years and by the end of 1840, Robert Dixon began work on the first plan of Brisbane Town in anticipation of future development. Queensland was proclaimed a separate colony on June 6, 1859, with Brisbane chosen as its capital, although it was not incorporated as a city until 1902. Over 20 small municipalities and shires were amalgamated in 1925, to form the City of Brisbane, which is governed by the Brisbane City Council. The Windmill in Wickham Park and the Old Commissariat Store on William Street are considered to be the oldest surviving buildings in Brisbane. Both were built by convict labor in 1828. The Windmill was originally used for the grinding of grain and as a punishment for the convicts who manually operated the grinding mill. The Windmill tower’s other significant claim to fame, largely ignored, is that the first television signals in the southern hemisphere were transmitted from it by experimenters in April 1934—long before TV commenced in most places. These experimental TV broadcasts continued until World War II. The Old Commissariat Store, originally used partly as a grainhouse, has also been a hostel for immigrants and used for the storage of records. Built with Brisbane tuff from the nearby Kangaroo Point Cliffs and sandstone from a quarry near today's Albion Park Racecourse, it is now the home of the Royal Historical Society of Brisbane. It contains a museum and can also be hired for small functions. During World War II, Brisbane became central to the Allied campaign when the AMP Building (now called MacArthur Central) was used as the South West Pacific headquarters for General Douglas MacArthur, chief of the Allied Pacific forces. MacArthur had previously rejected using the University of Queensland complex as his HQ, as the distinctive bends in the river at St. Lucia could have aided enemy bombers. Also used as a Headquarters by the American troops during World War II was the T & G Building. Approximately 1,000,000 U.S. troops passed through Australia during the war, as the primary coordination point for the South West Pacific. Brisbane staged the successful Commonwealth Games during 1982, and World's Fair (known locally as Expo '88) during 1988. These events were accompanied by a scale of public expenditure, construction, and development not previously seen in the state of Queensland. Brisbane City Hall houses the Museum of Brisbane and offices of the Brisbane City Council. Unlike other Australian capital cities, a large portion of the greater metropolitan area of Brisbane is controlled by a single local government entity, the Brisbane City Council. In 1925, the City of Brisbane Act was passed by the Queensland Government, abolishing 20 local government authorities in the city and forming the largest local authority in Australia, covering 460 square miles (1200 square kilometers). Since the creation of the Brisbane City Council in 1925 the urban areas of Brisbane have expanded considerably past the City Council boundaries. The City of Brisbane is divided into 26 wards, with each ward electing a councilor as their community representative. The Lord Mayor of Brisbane and Councilors are elected every four years by popular vote, in which all residents must participate. Brisbane City Council had an annual budget, in 2005, of approximately $1.6 billion, and an asset base of $13 billion. The Brisbane metropolitan area now covers parts of several adjoining local government areas including Moreton Bay, Ipswich City, Logan City, and Redland Shire. 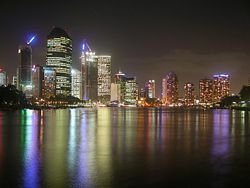 Brisbane city by night, looking north along the Brisbane River toward the central business district (CBD). Brisbane is one of the major business areas in Australia, and is the hub of numerous rail lines and highways, which bring produce from an extensive agricultural hinterland. The Port of Brisbane, on the lower reaches of the Brisbane River, can accommodate ships of up to 34,000 tons, and exports container freight, sugar, grain, coal, and bulk liquids. Brisbane's economy has white-collar and blue-collar industries. White-collar industries include information technology, financial services, higher education, and public sector administration generally concentrated in and around the central business district and recently established office areas in the inner suburbs. Blue-collar industries, including petroleum refining, stevedoring, paper milling, metalworking and QR railway workshops, tend to be located on the lower reaches of the Brisbane River and in new industrial zones on the urban fringe. Tourism is an important part of the Brisbane economy, both in its own right and as a gateway to other areas of Queensland. Popular recreation areas include the South Bank Parklands, Roma Street Parkland, and City Botanic Gardens. The Lone Pine Koala Sanctuary and Brisbane Forest Park, located in the city, are popular tourist destinations alongside the Story Bridge adventure climb and Portside Wharf. Brisbane has a range of retail precincts, both in the central business district and in the suburbs. The Queen St Mall has restaurants, cinemas, souvenir outlets, and shopping centers, including: Wintergarden, Broadway on the Mall, QueensPlaza, Brisbane Arcade, and The Myer Centre. Public Transport in Brisbane is provided by bus, rail and ferry services. The use of urban public transport is still only a small component of total passenger transport, the largest component being travel by private car. The Brisbane River has created a barrier to some road transport routes. In total there are six road bridges, mostly concentrated in the inner city area. There are also three railway bridges and one pedestrian bridge. Multiple tunnel and bridge projects were under way in 2008. An extensive network of pedestrian and cyclist pathways have been created along the banks of the Brisbane River to form a Riverwalk network. Brisbane Airport (IATA code: BNE) is the city's main airport, the third busiest in Australia after Sydney Airport and Melbourne Airport respectively. It is located near Eagle Farm, north-east of the city center and provides domestic and international passenger services. Archerfield Airport (in Brisbane's southern suburbs) acts as a general aviation airport. The Forgan Smith Building and the Great Court University of Queensland. At the 2006 census, the population of Brisbane was 1,763,131, making it the third largest city in Australia, or 138th largest in the world, according to World Gazetteer. Brisbane recorded the largest growth rate of all capital cities in the last Census, with an annual growth rate of 2.2 percent. Brisbane has a lower inner city population density than Australia's two largest cities, Sydney and Melbourne, although constant population growth is closing that gap. The city has a density of 379.4 people per square kilometer, which is comparable to that of Sydney. The lower population density reflects the fact that most of Brisbane's housing stock consists of detached houses, although the construction of apartments has increased the density of the city and inner city neighborhoods. The population of the central business district doubled over the five year period 2003-2007. The 2006 census showed that 1.7 percent of Brisbane's population were of indigenous origin and 21.7 percent were born overseas. Of those born outside of Australia, the three main countries of birth were New Zealand, South Africa, and the United Kingdom. Approximately 16.1 percent of households spoke a language other than English, the official language, with the most common being Mandarin, Vietnamese, and Cantonese. The median population age across the city was 35. Religious adherence in Brisbane presumably reflects that of Australia as a whole, in which, according to the 2001 Census, Catholics made up 26.4 percent of the population, Anglican 20.5 percent, other Christian 20.5 percent, Buddhist 1.9 percent, Muslim 1.5 percent, other 1.2 percent, unspecified 12.7 percent, and none 15.3 percent. 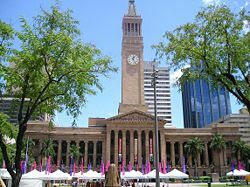 Brisbane has multi-campus universities and colleges including the University of Queensland (a member of the Group of Eight and Universitas 21), Queensland University of Technology and Griffith University. 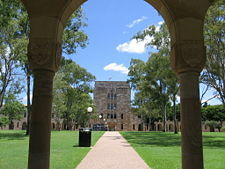 Other universities which have campuses in Brisbane include the Australian Catholic University, Central Queensland University, James Cook University, the University of the Sunshine Coast, and the University of Southern Queensland. There are three major technical and further education TAFE colleges in Brisbane; the Brisbane North Institute of TAFE, the Metropolitan South Institute of TAFE, and the Southbank Institute of TAFE. 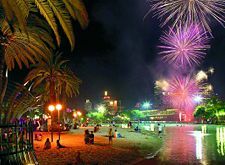 Fireworks over the South Bank Parklands man-made beach. Queensland Gallery of Modern Art (GoMA), located in South Bank. 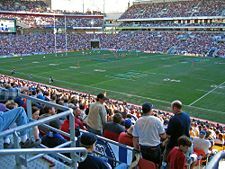 Suncorp Stadium, aligned for an NRL game. Pre-1950 housing was often built in a distinctive architectural style known as a Queenslander, featuring timber construction with large verandass and high ceilings. The relatively low cost of timber in South-East Queensland meant that until recently most residences were constructed of timber, rather than brick or stone. Many of these houses are elevated on stumps (also called "stilts"), that were originally timber, but are now frequently replaced by steel or concrete. The Queensland Museum is located at South Bank. The Queensland Gallery of Modern Art (GOMA), opened in December 2006, is one of the latest additions to the South Bank area and houses some of the most well-known pieces of modern art from within and outside Australia. GOMA is the largest modern art gallery in Australia, and holds the Asia Pacific Triennial (ATP) which focuses on contemporary art from the Asia and Pacific in a variety of media from painting to video work. 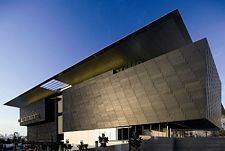 The Brisbane Powerhouse in New Farm and the Judith Wright Centre of Contemporary Arts on Brunswick Street in Fortitude Valley also feature diverse programs featuring exhibitions and festivals of visual art, music, and dance. Brisbane has a growing live music scene, both popular and classical. The Queensland Performing Arts Complex consists of the Lyric Theatre, a Concert Hall, Cremorne Theatre and the Playhouse Theatre. The Queensland Ballet, Opera Queensland, Queensland Theatre Company and other performance art groups stage regular performances in the different venues. The La Boite Theatre Company performs at the Roundhouse Theatre at Kelvin Grove. The Powerhouse complex, Twelfth Night Theatre, and Brisbane Arts Theatre also stage productions throughout the year. Major cultural events in Brisbane include the Ekka (the Royal Queensland Show), held each August, and the Riverfestival, held each September at South Bank Parklands and surrounding areas. Warana, (meaning Blue Skies), was a former spring festival which began in 1961, and was held in September each year. Run as a celebration of Brisbane, Warana was similar to Melbourne's Moomba festival. In 1996, the annual festival was changed to a biennial Brisbane Festival. The Brisbane International Film Festival (BIFF) is held in July and August in a variety of venues around Brisbane including the Regent Cinema in Queen Street Mall. BIFF features new films and retrospectives by domestic and international filmmakers along with seminars and awards. The Paniyiri festival at Musgrave Park (corner of Russell and Edmondstone Streets, South Brisbane) is an annual Greek cultural festival held on the first weekend in May. The Brisbane Medieval Fayre and Tournament is held each June in Musgrave Park. The Valley Fiesta is an annual three-day event organized by the Valley Chamber of Commerce. It was launched by Brisbane Marketing in 2002, to promote Fortitude Valley as a hub for arts and youth culture. It features free live music, market stalls, food and drink from many local restaurants and cafés, and other entertainment. The Bridge to Brisbane fun run has become a major annual charity event for Brisbane. Pike, Jeffrey. Australia. Insight. ISBN 978-9812347992. Statham-Drew, Pamela. The Origin of Australia's Capital Cities. Cambridge University Press. ISBN 978-0521408325. Steele, John Gladstone. 1972. The Explorers of the Moreton Bay District, 1770-1830. St. Lucia, Q.: University of Queensland Press. ISBN 9780702206979. Thompson, Peter, and Robert Macklin. 2000. The Battle of Brisbane: Australians and the Yanks at War. Sydney: Published by ABC Books for the Australian Broadcasting Corp. ISBN 9780733308963. This page was last modified on 25 June 2016, at 16:21.